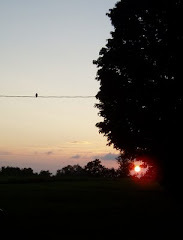 Confessions of a Podunk Princess - from the Upper East Side of NYC to the bumpy back roads of PDK, the scenery may change, but the playlist remains the same. I never thought I’d… be a NASCAR fan. For starters, I was born and raised a Manhattan Jew. Even more discerning, an Upper East Side Manhattan Jew. NASCAR was a foreign term, like IHOP or GED. I gotta admit…Confederate flags kinda scared me, conjuring up images of anti-Semitic mobs looking to throw a Jew down a well Borat-style. A Southern twang was far lower on my Moh’s Scale of Accents than British - but still less abrasive than German - and I was angry at the South for the way they treated my housekeeper‘s ancestors. I had some twisted notion that the South was a steamy, swampy region filled with monster truck driving, Jew hating, whiskey stilling, shotgun hoisting good ol’ boys… and any so-called “sport” born from such an oppressive place would be about as exciting as a spinal tap… and not Rob Reiner’s version. My own after-private-school activities focused on flirt chasing, not dirt racing. I knew how to select lipsticks, not dipsticks. 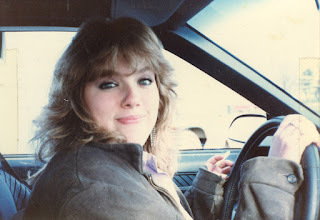 And the only reason to punch the accelerator in my ‘84 “Bitchin’ Camaro” was to catch up to the hottie at the next light. Yet…while pickup trucks and muscle cars were veritable anti-status symbols of rural residency, I could still be held spellbound by the pin-striped sports cars strutted in rockin’ TV commercials and tailgating on the Hamptons beaches. I wanted a ‘79 white Camaro with T-tops more than I wanted an “Elsa Peretti” Tiffany bracelet for my Sweet 16. I did like to drive. I mean really drive. Like fast. Maybe that was because everything I needed to know about driving, I learned from spending 75% of my life in the backseat of taxi cabs. I could strategize that if a city bus was pulling out three blocks ahead, and two people spaced 30 yards apart were waving for cabs on the next block, the trick was to dodge to the left. All the better to get to the country club quicker. And I was rewarded - okay, spoiled - with a sports car in high school (and the insurance and a spot at the garage on East 84th Street and a Mobil Credit Card that caused my dad more grief than my skyrocketing insurance) and spent every weekend using it to rocket myself off of the island of Manhattan. Setting the controls for the heart of the sun, I piled friends into my I-ROC for jaunts to the shore, zoomed country roads like I was in a Mad Max video, and often waited about 20 minutes to call my dad from my final destination as I was afraid he‘d do the math and figure out I had beaten my own best time. Daddy’s little girl wouldn't want to jeopardize her freedom. At 30 years-old, I just hit HYPERSPACE and landed in Ithaca, New York. (Raise your hand if you don't know what Hyperspace is for.) 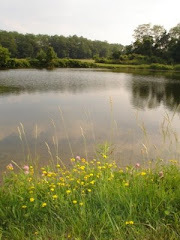 Centrally isolated yet culturally enriching, Ithaca - I had heard - was a good place to go to “find oneself”. 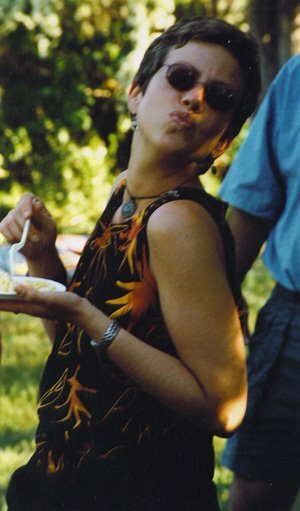 I had left Manhattan many years before, and had comfortably embraced locales with lots of trees and scenic lakes and roadkill, and in 1996 I was ready to find myself again … I just never thought I would “find myself” at a NASCAR race. 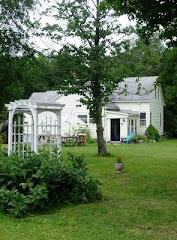 An ex-boyfriend once noted that I “had a little redneck in me” when I admired a stately double-wide out loud, but it wasn’t until I literally moved from Park Avenue to Podunk Road (in Trumansburg, NY) that I slowly began to embrace my inner yokel. My new husband was a seventh generation local, and our new house - on Podunk Road - was the “third one past the Jeff Gordon flag”. I recognized Jeff Gordon’s name - or number - as his image graced the front of numerous outdoor soda machines in our region. I also began a career in marketing. I sold advertising for a radio broadcasting company and was profoundly impressed by the stats on Country Music. Who’d have thought that the number one music format across the boards was Country… it more than doubled its runner up, Classic Rock, in ratings. I quickly learned that the road to selling a Country Music station was paved with NASCAR logos - and I was blown away by the stats on branding and customer loyalty. I eventually moved into print advertising and I am currently the marketing director for a small jewelry store in Ithaca. I get to be a wordsmith and a graphic designer, and according to my coworkers, the “Queen of Displays”. Fast Forward to February 16, 2008. Lunching at our local tavern with my husband , I glanced up at the television mounted over the bar and my jaw dropped. On the screen was hands-down the most handsome man I had ever seen, aside from my husband, of course. Two men were being interviewed as rain poured down behind them. One was tall with dark glasses and wore a freakishly big cowboy hat that looked like a bird had flown into the brim at 90 MPH. The other gentleman was much shorter and wore a brightly colored Cheerios costume, emblazed with the number 43. I asked a fellow bar patron who that 43rd Adonis was and he murmured what sounded like Bobby Lobotomy. I immediately craved a bowl of cereal and asked for the remote control so I could fill all the TV screens with his face. 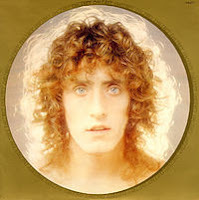 The last time I was held in such awe by male features was in 1976 when Roger Daltrey’s face filled the screen one quarter of the way into the movie “Tommy“. 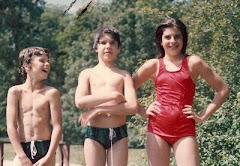 I was 10 years-old and it was defining heterosexual moment in my life. I became one with The Who, and even today my license plate today reads QDRPHNIA. But on February 16, 2008, I could not stop looking at the TV. And wild horses couldn’t drag that remote out of my hands. His name is Bobby LABONTE and he was the Winston Cup (now Sprint Cup) champion in 2000. He was chubbier then, and had a really bad haircut. I equated him to a fine wine that has aged more than gracefully. At 44 years-old (in 2008), he was George Clooney meets (a pre-Oksana) Mel Gibson. 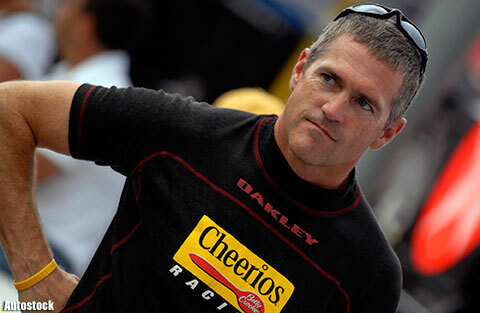 Some of the images I found showed Bobby Labonte driving a special pink car with a huge, pink ribbon on the side. 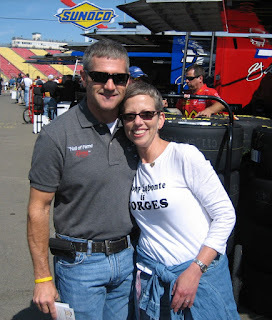 I was two years removed from a double mastectomy and chemo, and I felt an immediate attachment to this driver... and there were few images where he wasn’t sporting a LIVESTRONG bracelet on his perfectly sculpted wrist. 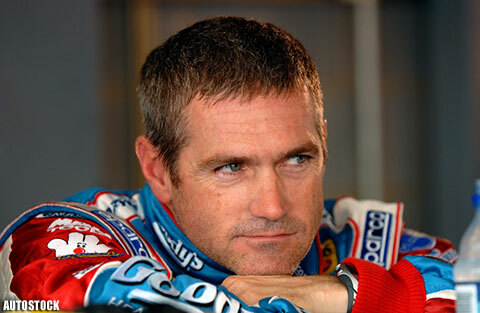 The more I read about Bobby Labonte, the more I learned about NASCAR. And the more I learned about NASCAR, the more I learned that I needed to learn more about NASCAR. 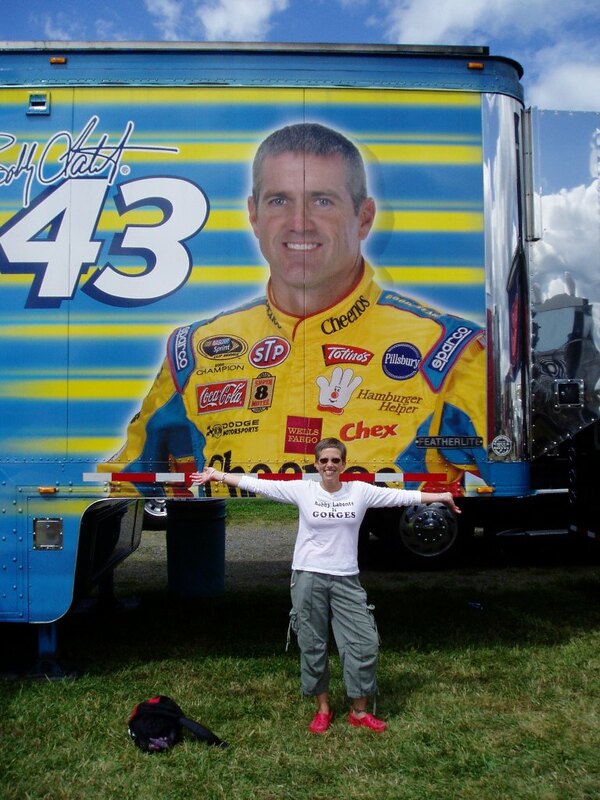 I invested in Liz Allison’s Girl’s Guide to NASCAR and it was the best love story I had read in ages! With rules explained and terms defined, this book became my bible... or, um, Torah. I was determined to talk the talk… and it would only be a few months before I would get a chance to walk the walk. 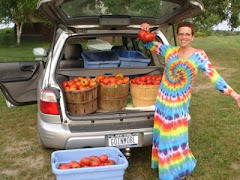 We live 20 miles away from Watkins Glen International, the home of American Road Racing, but a more personal/spiritual affinity for Watkins Glen stems from my past Deadhead Days - FYI the soundcheck tape from The Glen '73 is/was a “must have”. (I still have my copy). My husband and I decided to go check out a NASCAR race and see what all the fuss was about. I was already hip to the fact that The Glen is a “road race” - as opposed to a short track race (like Dover) or a restrictor plate race (like Talledega) - and I even had a custom t-shirt made that read Bobby Labonte is GORGES, a nod to Ithaca’s ubiquitous slogan "Ithaca is GORGES". And that t-shirt earned us free cold pit passes as the gatekeeper to this semi-restricted area recognized us as locals and granted us entry onto the skid marked, tread-littered pavement leading to the pits. Score! 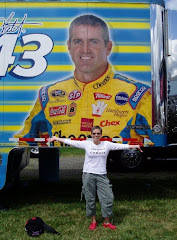 When we found the giant retail hauler with a gigantic image of Bobby Labonte on its side, I knew my pilgrimage hadn’t been in vain, and I begged my husband to take good photos for once. I immediately posted my beloved photos from our awesome weekend on Facebook, where an old high school friend, Michael, I hadn’t thought about in 25 years sees the photo posts pop up on a mutual friend’s page (now timeline), saw my profile picture of my license plate QDRPHNIA (The Who), and wondered how I was. He must have noticed my NASCAR photos because he then mentioned he had a good friend who works for a major racing team and that he was thinking about taking a trip to The Glen the following summer. Michael then surprised me with Hot Pit Passes, the golden tickets for any NASCAR fan. The scheduled royal treatment continued with a pre-planned surprise “meet and greet” with Bobby and I made a mental note to refill some valium. It's important here to note that Michael gave up the planned surprise a few days before… he said it was to keep me from driving over an hour to Tioga Downs near Binghamton for an autograph signing - with my 6 foot cardboard cutout of Bobby at my hip... but I think to keep me from fainting in the garage area. Ahhhhh.... 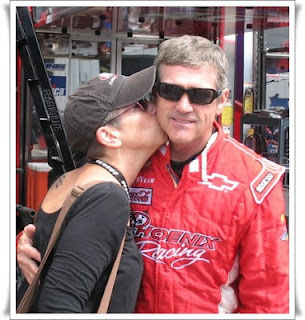 Describing meeting Bobby Labonte is an exercise in futility. Words just ruin it. And what I do remember is a blur. I fumbled my words, I pretended I could actually hear him over the massive engine revving, and I completely forgot to ask for an autograph. But he was as gracious as gracious could be, and when my friend Michael handed me a pen and snapped some photos with his own camera, I just wished time could stand still. And it wasn’t just Bobby who was gracious. Almost every driver I nervously approached with pit pass and Sharpie in hand happily granted me a moment of acknowledgment. 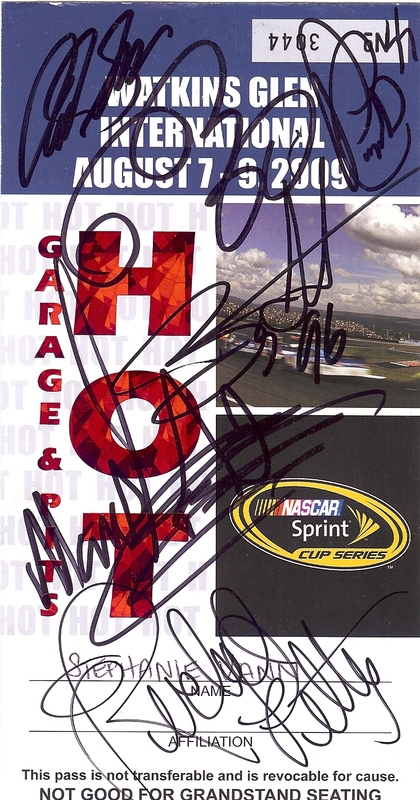 Carl Edwards, Joey Logano, Reed Sorenson, Marcos Ambrose (who won the Nationwide race that weekend)… I came away with a trophy pit pass and a whole new appreciation of the sport. And I rued the day I ever dissed NASCAR. My lord, I met The King! Spending the weekend with the people behind the NASCAR curtain was an eye-opening, ear-popping, jaw-dropping experience…and I decided then and there that this was a circus I would gladly run away with. So who was the clown now? Just call me a redneck and I will happily show you my sunburned neck and red nose... and my credentials! Fast forward to 2010. He remembered me! Pretend this is in Hebrew, and kinda start at the end... I'll never get this formatting.. The story really starts at the end... but doesn't it always? As my memory both bursts with ideas and fades into fogs, I am blahging... maybe someday I'll remember where I was going with it. In the meantime.... sit back and enjoy.... and please keep your arms an legs in the cars at all times. "so, bobby, how does it feel to be GORGES?" Ummm... what was that again? Why Do People Hate Balloons? "Russell! I think we should work on that last line!" Vote Harley for Governor of Idaho! 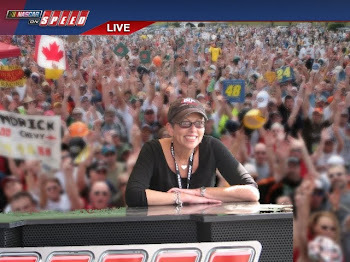 and Who freak, and breast cancer survivor, and NASCAR fan, and writer... I think! and I'm diggin', diggin', diggin', diggin', diggin'! 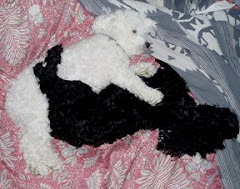 Amoreena - Elton John (Tumbleweed Connection) - if I had a daughter (or even just a "girl" pet) that's what I would name her. Celluloid Heroes - The Kinks (One for The Road) This version is the best musical intro ever! I'm SOLD on Chris Vann! We've even got a sauna! This is my back yard now! 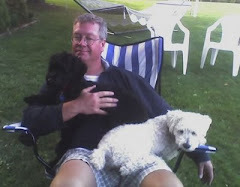 My husband and our dogs. Pretty soon, she'll be your best friend too! We've been friends friends since we were about 8.
so when we do all get togther, we try to make it memorable!